Itchy, sticky, watery, red and puffy eyes... Sound familiar? Lubrisine? eye drops work in just minutes to soothe and lubricate dry, itchy and irritated eyes. Tired eyes come alive again with only a few drops in each eye. Lubrisine? eye drops nourish the eyes with beneficial ingredients, unlike the chemicals contained in other eye drops. Lubrisine? eye drops provide brilliant allergy season relief as well as focused nutrients directed towards improving the overall health of the eyes. Use Lubrisine? eye drops first thing in the morning to awaken the eyes. Use them just before bed to lubricate the eyes while you sleep. Use a few drops throughout the day and avoid the need to rub. "All of my adult life, I have had to use mast cell stabilizing drops in my eyes, steroid drops, antihistamine drops, lubricants, or a combination of all of these during summer allergy season. 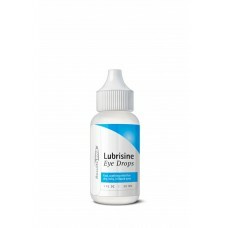 Yet, neither over-the-counter, nor Rx anti-allergy drugs felt as good nor performed as well in accomplishing allergic eye itch relief as did Lubrisine." Formula derived using a proprietary nutrient extraction process with ultra-distilled water, Burdock Root (Arctium lappa), Eyebright Herb (Euphrasia officinalis), Blessed Thistle Herb (Cnicus benedictus), Angelica Root (Angelica archangelica), Devil?s Claw Root (Harpagophytum procumbens) and Advanced Cellular Silver. Place 1 - 2 drops in each eye. Eye drops can be taken as frequently as desired. Take Lubrisine? eye drops with Sinus Care? intra-oral or Sinus Care? nasal spray. Lubrisine? is produced under strict GMP manufacturing controls in conformance with guidelines for dietary supplements set forth in USP XXVII. For purity and quality, Lubrisine? contains no preservatives ? no alcohol ? no artificial coloring or flavoring.